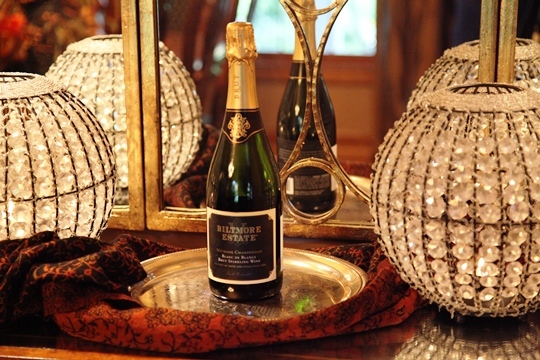 Here’s a great bubbly wine for Holiday fun! 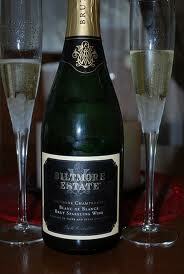 The Biltmore Estate Blanc De Blancs is absolutely delicious! Everyone who knows me knows how much I LOVE sparkling wine! So, it goes without saying that I was absolutely delighted when I received a bottle of the Biltmore Estate Blanc de Blancs to review for our Holiday Gift Guide. This sparkling wine is priced just under $25 and would be perfect to give as a gift, to serve at your holiday parties, or to enjoy with your sweetie. 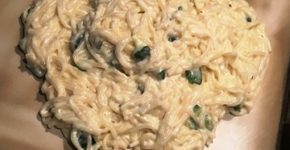 I decided to serve it at a small dinner party we hosted and it accompanied our appetizer course. The Blanc de Blancs was crisp and the finish was clean and tart. 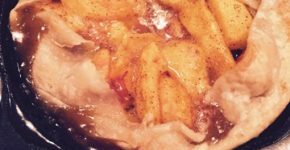 It had hints of green apples and pears. This sparkling was so refreshing and really paired perfectly with the appetizers. It would also be great paired with seafood or cheeses . This wine is a brut – which means it is slightly dry. It has tons of tiny bubbles that we all have come to love in a sparkling wine. Serve it well chilled – 40 to 45 degrees. 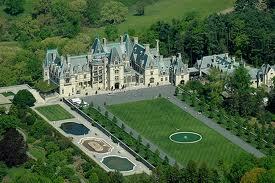 I was surprised to learn that the Biltmore Winery is the most visited winery in the United States. The Biltmore is located in North Carolina and approximately 600,000 visitors stop by to sample their award winning wines each year. The Biltmore Winery opened in 1985 as an extension of the Biltmore Estate. I toured the Biltmore Winery shortly after it opened. It was delightful to view their bottling rooms, stroll through the cellars, and of course, taste their award winning wines. Speaking of awards, the Biltmore Estate Blanc de Blancs took home a Gold Medal with 91 points at the Los Angeles International Wine and Spirits Competition in May 2012. This competition showcases the finest in domestic and international wines. You can visit their website by clicking here, Biltmore Estate Winery. There you can learn more about all of their wines, locate a retailer near you, or order their wines online. I plan on having several bottles of this bubbly on hand to enjoy during the holiday season. To view the Video review of the Biltmore Estate Blanc de Blancs, click here: Biltmore Blanc de Blancs Video Review. I received a bottle of the Biltmore Estate Blanc de Blancs in exchange for my honest review. I was not compensated in any other manner. The opinions expressed above are my true and honest opinions.